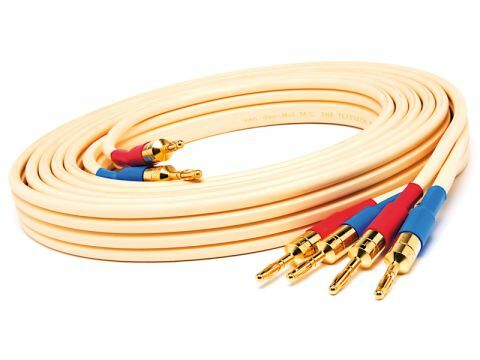 Even by van den Hul's standard this is a pretty oddly named bi-wire speaker cable, but construction is sane enough. Each conductor is a composite of silver-plated copper and 'linear structured carbon', vdH's trademark material which, while possessing considerably higher resistance than metal, avoids the problems (whatever those are) of metal conductors and their crystalline structure. The carbon fibres are arranged around a core of many thin copper strands and this arrangement plus the use of 'Hulliflex' insulation makes for a cable which is, at least, flexible in one direction. Being flat (25mm wide) it's completely intractable in the other direction, but it's not too tricky to handle. Our sample was terminated with vdH's own multi-purpose end sockets – just screw-in 4mm or spade terminals to suit. We found this a most satisfactory cable. It's not perfect and we reckon there's a little more extension in the bass it might have retained, plus a shade more treble sparkle, but it does achieve good results across the board: superb in some areas. Rhythm is very good, with a really well-timed kick in the upper bass and tonal neutrality from low midrange upwards is also very fine. Detail, meanwhile, is very good indeed, clear but never forced or thrust upon the listener. We found ourselves re-evaluating a couple of very familiar tracks, after a session with this cable in circuit revealed information we hadn't previously noticed. It also thoroughly confirms the benefits of bi-wiring, sounding noticeably less precise when connected up with wires in parallel, single-wired.